er große amerikanischen Dokumentationskanal „HBO“ hat eine wunderschöne Dokumentation über unser Klosterleben anlässlich des Erfolges von „Chant-Music for Paradise“ gemacht. Millionen Menschen haben diese Dokumentation in USA und weltweit gesehen, nun gibt es sie als DVD: „The Top-Ten-Monks of Stift Heiligenkreuz“. Einfach unter bestellung(at)bebeverlag.at bestellen. 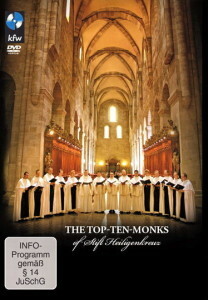 Die DVD ist ganz in Englisch, aber sehr verständlich: In 2008 the ancient Cistercian Abbey of Stift Heiligenkreuz outside Vienna was all but overwhelmed by the events that befell it: the megamusic company Universal Music „discovered“ the Gregorian Chant of the monks and thereby set in motion what was to become an international success with the CD „Chant – Music for Paradise.“ All the same, the „Top Ten Monks“ saw to it that their life of modesty and silence for God was not upset by all the attention. This documentary follows this success story and offers a unique behind-the-scenes look at a life characterized by harmony and spirituality in one of the most beautiful monasteries in Europe.